Travel off road for longer & explore the most remote landscapes in true comfort and style. Ideal for 2-4 people. The Aurora 19ft, features our new faceted body design, unique to the industry, allowing exceptional manoeuvrability whilst decreasing fuel consumption of the tow vehicle like no other van on the market. 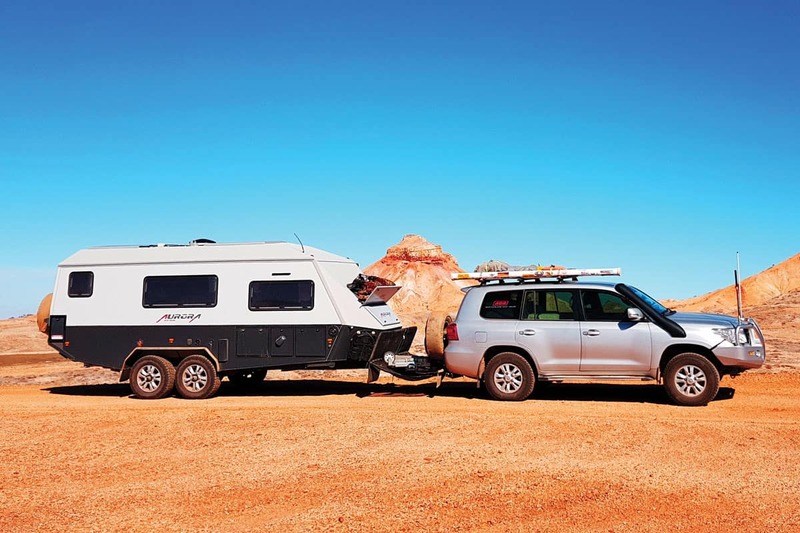 The Aurora has up to 900 kg load capacity, 2500kg Tare, is light for its size and has excellent exit and entry angles, perfect for traversing tight bush tracks and can carry up to 340 litres of water into remote camping areas. Features massive storage and luxury European inspired furnishings complete with a Queen size bed as standard and optional twin beds. The internal full ensuite with separate marine macerator toilet system with 140 litre capacity & shower ensuite with vanity and large mirror, storage drawers throughout, can also be fitted with grey water tanks plus recycled water system. The Aurora provides all the creature comforts of home in a stylish European décor with large water storage plus the benefits of an advanced solar system. Completing this brilliant design are the two extremely versatile kitchen areas. Standard design has a large internal kitchen featuring stainless steel sink and drain board with hot and cold mixer tap with large preparation areas, 3 burner gas stove with glass top allowing for no loss in usable bench space, 175L upright fridge / freezer. External sliding stainless steel 2 burner grill kitchen featuring pantry and hot / cold sink and shelf to suit optional BBQ. Aurora comes standard with air conditioning, modern, flawless finishes are featured throughout the Aurora, from the materials used in the seating to the unique overhead cupboard design and full width ensuite – this really is the perfect example of sophisticated off road living. More detailed information on key features for the AOR brand. For a full detailed list of Specifications, please fill out AOR’s online download a brochure form. The photos in this gallery display standard and option features of the Aurora.